Second Chance for Lost Galapagos Tortoises? 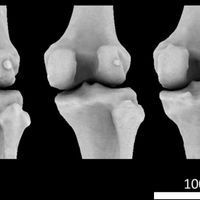 Researchers are trying to recreate an extinct species of the lumbering reptiles by breeding closely related species that contain traces of the lost lineage’s DNA. Lonesome George, the last surviving Pinta giant tortoise (Geochelone nigra abingdoni) on Santa Cruz. 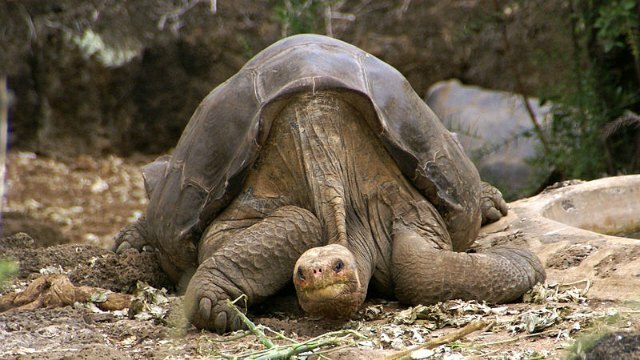 He died on June 24, 2012.WIKIMEDIA, PUTNEYMARKGiant tortoises that once inhabited the Galapagos Island of Floreana may get another chance at existence, thanks to the efforts of researchers working to recreate a close genetic facsimile of the species by breeding together related species that contain traces of the extinct reptiles’ DNA. Scientists working in the far flung archipelago have corralled more than 30 tortoises with morphologies reminiscent of Floreana tortoises that have the highest amounts of Floreana tortoise DNA, each enclosure containing three females and two males, in the hopes that the animals will mate and produce offspring that approach the genetic profile of the long lost species. Scientists declared the Floreana tortoises (Chelonoidis elephantopus) extinct in the 1800s, a result of sailors of the era capturing and eating the animals on long ocean journeys back to Europe. 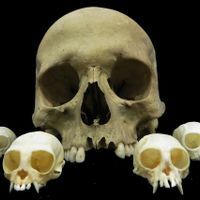 But in 2008, researchers studying tortoises on the island of Isabela discovered that some individuals in that population contained genetic traces of Floreana tortoises. 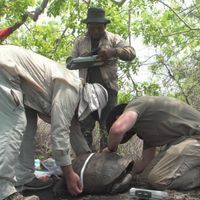 This week (September 13), an international team of researchers that included Tapia provided an update in Scientific Reports that described the genetic makeup of tortoises they captured and relocated from a remote volcano on Isabela Island to a captive breeding facility on Santa Cruz Island. Of 150 Isabela tortoises, 64 had marks of C. elephantopusancestry, and 32 were placed in breeding corrals on Santa Cruz Island. The hope is that these tortoises—who are thought to contain traces of C. elephantopus DNA because sailors would sometimes offload animals they had collected on Floreana on Isabela to lighten their ships’ loads—can mate and produce offspring that have even more substantial chunks of the extinct species’s DNA. 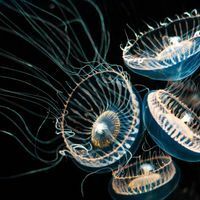 “I can assure you that I helped to clean and prepare the corrals where they were housed and there is space, plenty of food and water,” Luciano Beheregaray, a coauthor and geneticist at Flinders University in Adelaide, Australia, tells Wired. As the lumbering reptiles are typically slow to reproduce—individuals can take 25 years to reach sexual maturity–the results of the resurrection effort will take some time to emerge. But the researchers hope that tortoises containing larger traces of C. elephantopus DNA will one day repopulate Floreana, which will slowly drive evolution of the translocated population and the island’s landscape. “I am intrigued with letting these imperfect tortoises go and letting evolutionary process refit them to the island,” James Gibbs, a coauthor and researcher at the State University of New York College of Environmental Science and Forestry in Syracuse, tells Wired.